Anyway, when you can’t sleep and have two people lying on you, all there is to do, besides play the alphabet billboard game with yourself, is wonder that quintessential childhood question: “Are we there yet?” Such a question drives every parent to drink (sweet tea) as the answer is clearly that if we were there, we would have already stopped. Obvious enough? Not to a child, apparently. Not to us adults either. God makes us so many promises, and He is always so faithful, but all we seem to want is the fulfillment of the next promise — and now. We ask our Heavenly Father the same question I used to ask my earthly one so many times: “Are we there yet?” And with that question, we show that doubt has taken root in our hearts. I ask Him if we’re there yet on our finances. Our bills are paid, but that beautiful budget that my husband and I never seem to actually implement stares us in the face. I ask Him if we’re there yet on this fix-Suzy’s-personality-thing. I remind Him that I called a whole blog “The Beam in My Eye” and have drawn attention to every flaw I can think of about myself, but yet, my issues are still there. I ask Him if we’re there yet on Dusty’s and my future. Kids or no kids? Leadership or no leadership? World change or television-channel-change? Is this it for us? 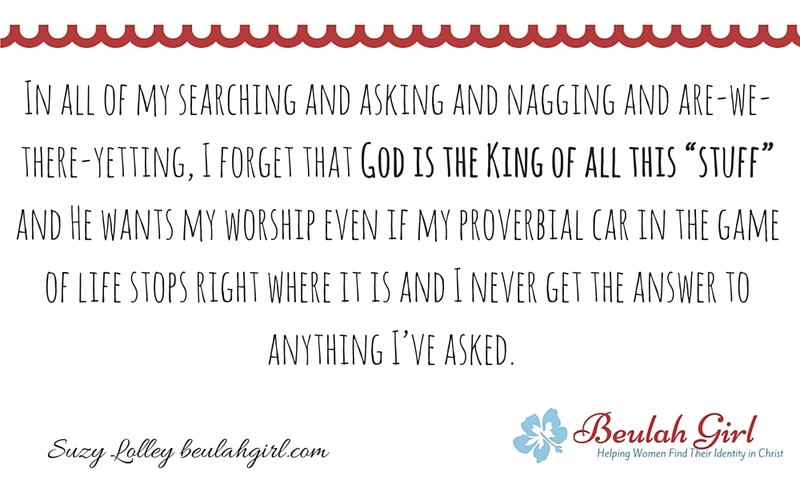 In all of my searching and asking and nagging and are-we-there-yetting, I forget that God is the King of all this “stuff,” and He wants my worship even if my proverbial car in the game of life stops right where it is and I never get the answer to anything I’ve asked. Because I don’t deserve these answers. What I deserved, Jesus took on the cross, and thank God for that. However, I know that because God is gracious, all the important wonders of my life are going to be resolved by a loving Father. 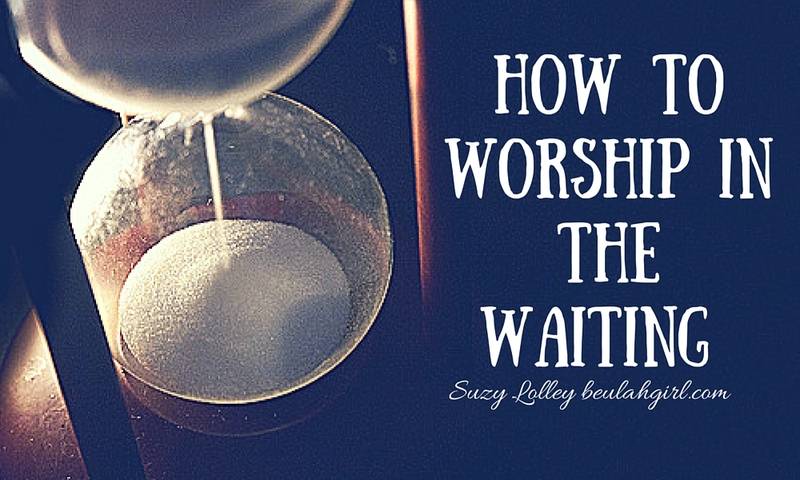 I just have to embrace His time and remember to worship in the waiting. I feel like God has made some huge promises to me in my lifetime, and He will fulfill everything He’s said. However, in the day-to-day, I often struggle to actively believe the promises, thinking instead that maybe I conjured them up or misunderstood God. Even so, I am comforted that I’m not the only one who has ever felt this way. Two Bible men, David and Elijah, had incredible lives and ministries; however, they both also went so far as to shrink from God’s promises by hiding in caves. In 1 Samuel 22, David has already been anointed king, as I shared in another post on this blog. However, he finds himself in the Cave of Adullum, a fortified cavern usually populated by a different clientele — criminals. God proved His love to David when He allowed the young shepherd boy to kill a lion, a bear, and an inhuman giant. He proved it again when He had Samuel choose David from out of a stock of what the world would consider superior brothers. Most recently, he had proven it when he allowed David to form a covenant with his enemy king’s son. Didn’t David believe that God would provide victory for him over that same king, Saul, whom God had rejected? Why, then, was he hiding in a cave? Because he found that to trust while he waited on a promise he considered unlikely just was too risky. David was so very human that he doubted the fulfillment of God’s promise. And what of Elijah’s doubt in the downtime? He is truly one of the biblical greats, a prophet whose amazing life is recorded in 2 Kings. A man who would later perform more than double Elijah’s miracles, young Elisha thought so much of his hero that he followed him around even to his catching away by the Lord in a chariot of fire. Elijah was known for stopping the rain, raising the dead, multiplying food in a famine, and even calling fire from Heaven, just to name a few. Did you catch those? Despite all these displays of God’s power, though, Elijah succumbed to depression and found his own cave. Wanting to rest from his seemingly solo task of taking on evil personified in King Ahab, Elijah came to a point where he was ready to give up and even die. But God appeared to Elijah in that cave in 1 Kings 19:12: “And after the earthquake a fire; but the LORD was not in the fire: and after the fire a still small voice” (KJV). At that moment, He showed up to prove a point to Elijah that He also proves to us today. God is very faithful and very present. He has not said one thing He will not do. When He said David would be king, king he was, and no Saul could stop him. No adultery could stop him. Not even the death and rebellion of his children could deter him. Psalm 119:89 assures us that God’s word, whatever it is, is “forever … settled in heaven” (KJV). Doubting God’s promises may not falsify them, but doubting will certainly delay the sure word’s fulfillment and discourage us too. Had King David known what an example he would be of knowing the Father’s heart to us living in the new covenant, he would have come out of the cave of hiding to wait confidently on the Lord’s provision for his kingdom. And had Elijah only realized that God’s promise for him was more than death by the way of other prophets, maybe he could have seen that chariot of fire in his mind before it came in reality to translate him straight from this world to the next. I have many unfulfilled promises in my life, but I don’t want to just hide in a cave and wait for them to come to pass. I want to believe God in the waiting stage. I want those who see the fulfillment of the promises to know that they were birthed out of seasons of trust and hope from a woman of faith who chose to embrace God in her weakness and seek Him until her strength came. And as I ask God many more times in my life, “Are we there yet?” I want to trust that for each and every promise, we will reach there just in time.